It is becoming increasingly clear that you can believe in government accountability in Canada, or you can support the Harper government, but you cannot do both, any more than you can support not being on fire and simultaneously play with matches while sitting in a wading pool full of gasoline. The fact that Canadians are not even more up in arms against the most secretive government in Canada’s history’s unwillingness to be accountable to or transparent with its own citizens is astonishing. Here’s a perfect example of those pesky Access to Information laws giving Canadians a glimpse inside the actions of this government that makes Stephen Harper uncomfortable. Can you imagine writing a letter to the federal government asking them to change half a dozen laws you found inconvenient, as well as to change Canada’s relationship with First Nations, and having them rapidly do exactly that according to your whim? No? Well then you are obviously not an oil company, because that’s precisely the kind of yes man for the industry this government has been. So the good news is that the kind of current ugliness we’re seeing over the senate scandal may be a thing of the past. The bad news is that next time it will be easier to get away with it, to sweep it under the carpet, and to leave no trail of evidence. Is that progress? Facing possible scrutiny over how unbelievably partisan and lopsided the Canada Revenue Agency’s approach to charities is through yet more Access to Information requests, they respond by destroying a ton of evidence pertinent to the question. So much for transparency. Instead, we get something that feels like a pre-emptive “hide the bodies!” approach to the question of whether one of the nation’s more powerful agencies is serving as political attack dog for the party in power. Perhaps in the interest of public honesty we should simply rename the CRA the Canadian Suppression of Dissenting Policy Agency instead. It would be an embarrassment if it wasn’t already something significantly more vile than that. And now we have reached the logical end point of this journey, where in order to avoid being accountable to Canadians about their actions we now have the government meeting with the same fossil fuel interests that were writing policy earlier, but this time with no official records of what took place at all. None. Feel like filing an Access to Information request about it? There’s nothing to see, apart from an entire nation being deliberately kept in the dark. 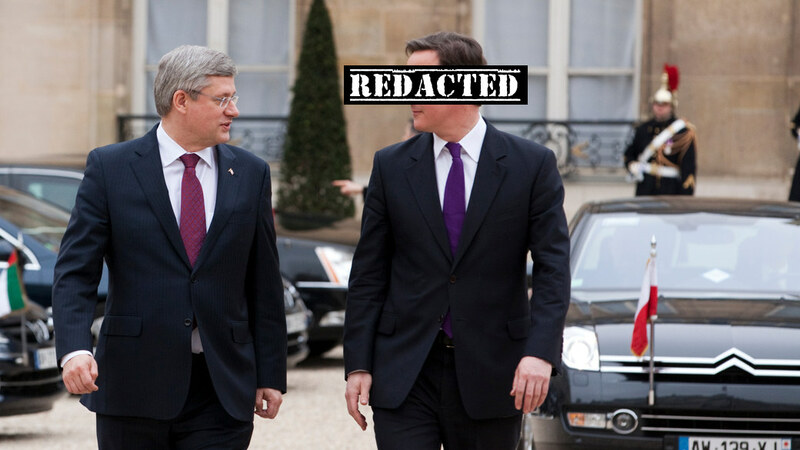 This is how the government meets with the oil industry: in secret, without records, without minutes, without notes. So that you can never know what took place. Not quite the “new era of accountability” we were promised, eh? About Michael Nabert: During the last Federal election, I was naive enough to think that this was as bad as the Harper impact on Canada could get. Boy, was I wrong. Now all I want is an opportunity to dedicate myself full time for a couple of months to trying to bring his regime to an end while there’s still bits of Canada I find recognizable. Can you spare a buck towards unleashing me on them? I also hope to organize a bunch of people to politely reach across the political divide to speak words of reason to supporters of my political opponents. Join me/find out more here.